Is LottoPark a Scam or Legit? Read 2 Reviews! Looking at LottoPark.com, I expected to see something different, something new. This is an online lottery concierge service for seven lottery games. This is a straight lottery play with no syndicates and no limit on how many tickets lines you want (including choosing only one). There is no VIP club, no multiple draws or subscriptions. So what is there? 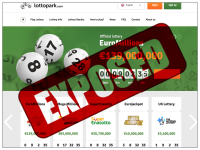 LottoPark provides online access to seven lottery games: EuroMillions & EuroJackpot, US Poweball & Mega Millions, Italian SuperEnalotto, UK Lottery and Polish Lotto. Players can play one line or more. There are no discounts for more ticket lines, no multi-draw or subscription options. There is a minimum deposit of €10 to open the account and then it’s weird as they say in their Terms & Conditions that the minimum for credit cards is €2.50. So say you want to play Polish Lotto (like one ticket is €0.70) then put the money in your account and then play. LottoPark accepts the usual credit card and bank transfers, plus a crypto currency Bitcoin, plus SOFORT (new one on me), Skrill and Neteller. Hey – where’s PayPal? Don’t look here for any syndicates – there aren’t any. LottoPark.com also doesn’t seem to offer subscription or multiple play options. This is a buy your lottery tickets online and come back and decide what you want to play. Whether a lottery offers an annuity or lump sum, you agree that any jackpot will be paid in the lump sum option. Well, less any taxes, fees, handling charges and other costs. There is nothing written on what those handling charges for collecting your winnings will be. But for winnings under €10,000, LottoPark will get your winnings and put them in your account. Anything over that they will negotiate with you (yes weird). The minimum amount to get your winnings is €5 and takes 3 to 5 business days to process and then could be up to 7 business days to receive. LottoPark.com offers a first time/welcome bonus of which is a free participation in a pool of players in a lottery. There is no info on what lottery game it is or how many people are in this pool and what makes this even weirder is there are no syndicates on this site. Ditto bonus for “Tell a Friend”. Though LottoPark.com says they will answer your questions 24/7, they also say they usually respond to emails within 48 hours. There are two email addresses, a UK phone number available Monday to Friday GMT 10:00 am to 6:00 pm and a UK snail mail address. LottoPark is operated by a UK company but owned by a Curaçao company. LottoPark is available in English or Polish, hence why, I guess they are one of the few sites that offer the Polish 6/49 Lotto. The jackpot isn’t great at the same the buy in is small, so could be an interesting way to jump into lotteries. This site looks pretty straight forward though there are a few things that did get me wondering, especially what the handling charges would be to get my lottery ticket. The other thing – they don’t actually say they don’t take commission, but then that could be part of the handling charges. This site gets a thumb’s down for lack of creativity. Though I hesitate to sign into subscriptions, I do think it is one of the things that make playing lotteries online useful. Just as long as there is a way to opt out! Good site, but customer support is not user-friendly, it has no live chat, it is an average site.